Eye Trax, a global manufacturer of wireless camera systems, adds two new camera systems to its product line-up – the Mega and the Predator series. The Eye Trax Mega series cameras are designed for security applications that require exceptional high resolution images, up to 12MB (4000 x 3000 pixels), of recorded events. The Eye Trax Predator series fills a void in the market for reasonably priced camera systems offering both video and still image capabilities to capture events. 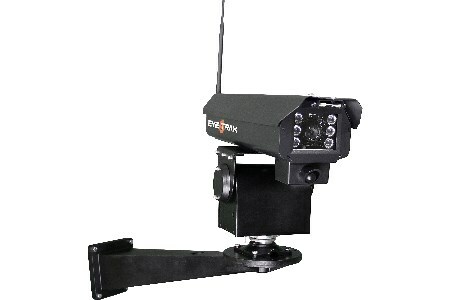 Eye Trax Mega and Predator camera systems use available wireless and cellular networks to transmit information, eliminating the need for the infrastructure of a computer, phone line, internet connection, router and power, which is required for the ‘traditional wireless cameras’. Additional features like solar power generation make Eye Trax camera systems truly an ‘off-grid’ and reliable solution for customers looking for remote security and site surveillance anywhere in the world. “Eye Trax has designed the best remote surveillance camera for today’s marketplace by considering all the factors, including high definition images, motion-activation, web-based software, mobile-based applications, ease of installation and time-lapse video,” says Eye Trax President Jerry McSorley. The Mega units offer pan tilt zoom capabilities to further enhance the ease of use while providing the highest resolution available that technology has to offer. The Predator camera system can monitor human and vehicle activity up to 250 ft away with an optional battery-operated, wireless motion sensor, while the night vision capability provides 125 ft of invisible infrared light. The Predator series also has the capability to stream 30 sec. video increments via a low-resolution VGA stream (640 x 480 pixels). The system is set to continuously record, and once an event is triggered, the system streams the preceding 10 sec. (buffer) and the proceeding 20 sec. for a ‘live’ feed of what is happening. Events captured by the Eye Trax cameras are time and location stamped, and then they are immediately sent over the secure cellular network to the company’s cloud-based servers, which sends out notifications of the event a via text message to any mobile phone, as well as emailed to designated addresses. All acquired images are stored on the cloud-based servers for future reference. SMS pictures or email from the Eye Trax Camera can be received 24 hr/d or set to specific time parameters, such as after operation hours. These camera systems are powered by a very small, lightweight solar panel (20 x 20 in.) — requiring only 12V to operate. An internal battery, located inside the aluminum housing of the system, allows the cameras to operate for a full five days in the event of inclement weather. Both new camera systems can operate in a temperature range of -10 to 140°F. The mounting bracket for these Eye Trax cameras is fully orbital and can be attached to any surface, including the company’s Barrel-Mounting System.